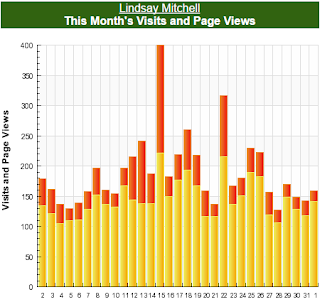 Blog stats are not my priority. I don't monetize. But I would like to understand why the anomaly between Blogger Stats and Sitemeter data. 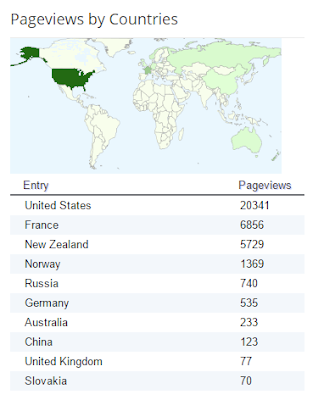 Averaging over a thousand page views a day mostly from the United States. Can anyone explain this to a naive blogger? Reader Jamie has been leaving links on a post I wrote in 2014 about what was starting to happen as tobacco taxes rose. "A lucrative black market for cigarettes is fuelling an increase in armed robberies, with criminals targeting dairies and stealing tobacco products to order. In the last seven weeks, robbers have targeted at least 17 Christchurch businesses, including dairies, pubs and bakeries. That compares to 12 in the first five months of the year." "In Napier a father and son produced a hockey stick and table leg from behind the counter and fought back after two masked robbers, armed with a claw hammer and crowbar, attacked their dairy on August 26." This was utterly predictable and is unconscionable. If you feel frustrated and impotent under cynical and pragmatic governance, watch the father and son beat back the would-be burglars. The fuss over naming the new ministry to replace CYF 'Ministry for Vulnerable Children' is axiomatic of the public service and associated agencies. The new Children's Commissioner objects to the name as "stigmatising and labelling". Metiria Turei says it's "very negative, takes a deficit and exclusionary approach to supporting children and families. " Labour want a Ministry for Children - no adjective. Marama Fox of the Maori Party says, "If it was up to me I would be looking to set up a Ministry of Family or a Ministry of Whanau. We need to fix the whole of the problem." "The name falls squarely into the “deficit” model of thinking that fails to express a sense of aspiration for the children in care." The new Ministry will be dealing with children who are vulnerable. It follows the passage of the Vulnerable Children Act 2014. Its name is entirely befitting. And Anne Tolley is to be commended for sticking with it. But there is ongoing resistance. The Children's Commissioner says he will only refer to the Ministry by its Maori name. Oranga Tamariki. "Oranga Tamariki is the silver lining here; it is redemptive. Not only because this is more inclusive of Māori children—who count as 60% of the children in care—but also because it is aspirational. “Imagine the reaction to a door knock from a badged Vulnerable Children’s worker,” asked Becroft. 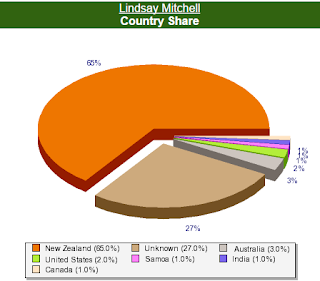 Compare this with someone representing Orangi Tamariki. This convinced me that the new name—while accurate—isn’t helpful. Tolley argued that a name “won’t save a single child,” but if it does open one door that might have remained closed, it might. Becroft is urging all in the sector to only use Oranga Tamariki, hoping that the English version will “wither on the vine.” This is a good idea. A name is, as he notes “only the start,” but an important one. It is up to the Ministry, and those working with children and their communities to provide care that lives up to the better name. Anyway, I thought I should find a translation of the name that we are all being urged to use before I wrote this post. That'll look good when it comes to boasting our credentials to the international children's rights police, UNICEF - The Ministry for Child Survival. Twenty years after Clinton signed off the major welfare reform bill in the US, the Personal Responsibility and Work Opportunity Reconciliation Bill, the results are still getting a bad rap from the left. Even the Economist ran a skeptical report saying the record was patchy and the reforms had failed to touch deep poverty. Some states have worked a lot harder to use their capped welfare grant to best effect than others. That criticism has some validity. Also, sadly, there are always some in society who can't and won't be helped. New Zealand has its own share of people with intractable, self-destructive inclinations. I've seen people who have been through every source of available assistance to the point where even the Sallies have washed their hands of them.Ultimately propensities for addiction and aggression can only be overcome with a resolve from the individual harbouring them. But I digress. There have also been some hysterical claims about the reforms pushing Americans into levels of third world poverty. Robert Rector, who has written about welfare and poverty in the US for decades examines the claims here.